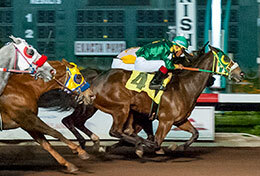 Apollitical Flying, under jockey Jesus Ayala, gets the fastest qualifying time for the Los Alamitos Maiden Derby on Sunday night. LOS ALAMITOS, CA—JANUARY 27, 2019—Scott Bryant, Joe Dee Brooks, Lee Lewis and Derrol Hubbard's Apollitical Flying posted the fastest qualifying time to the $101,000 Los Alamitos Maiden Stakes (not black type) for 3-year-olds after pulling away late to beat Jesus Avila's Kid Comeback in the fourth and final trial on Sunday at Los Alamitos Race Course. Led by Apollitical Flying, a total of 34 horses competed in the Maiden Stakes trials at 350 yards with the horses with the 10 fastest times returning here for the final on Sunday, February 17. Horses had to have been maidens as of December 1, 2018 in order to be eligible for these trials. 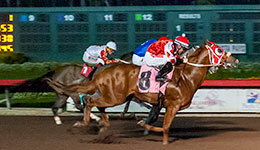 Ridden by Jesus Rios Ayala for trainer Justin Joiner, Apollitical Flying was a maiden coming into this race, but he came away from the race a winner after his strong finish from post one helped him to his first score in six career starts. The Oklahoma-bred covered the distance in :17.615. "(Apollitical Flying) did a really nice job and has been improving a lot," Joiner said. "He's a slow learner. It's taking him a few races. This horse has also had to run against tough horses. If you look at the program, two races ago before tonight he ran fourth but it was a fourth against Seaduction, Chocolatito and the Grade 1 winner Wave Her Down in a trial to the Los Alamitos Two Million Futurity. Wave Her Down beat him by only a neck for third place in that race. This horse is improving every time. "This Maiden Stakes is a perfect thing for him," Joiner added. 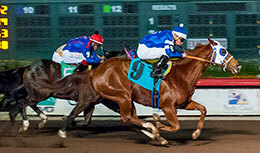 "It's a great thing that Los Alamitos has this race for these type of horses. It gives them a place to fit. The owners agreed to let me leave this horse at Los Alamitos for this race. Scott Bryant (owner of AQHA and PCQHRA champion Flash And Roll) owns a part of this horse with Joe Dee Brooks, Lee Lewis and Derrol Hubbard. They partner on a lot of horses and they have a lot of fun." Bred by Rancho El Cabresto, Apollitical Flying is by Apollitical Jess and out of two-time graded stakes finalist Southern Fling. She competed in both the Restricted Grade 3 Oklahoma Bred Derby and Grade 3 Fair Meadows Belle Stakes in the summer of 2008. Pedro Rangel's Cavuto posted the second fastest qualifying time of :17.626 after winning the third trial by a neck. Ridden by Cesar Franco for trainer Jesus Nunez, the colt by Foose will be the only horse in the Maiden Stakes final with two victories to his name. 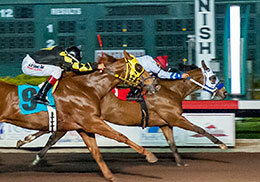 EG High Desert Farms' Mayas Signature, under jockey Cruz Mendez, defeats Alacarrera in the second trial on Sunday. "He's always been knocking on the door, but he's found his way to the winner's circle in his last two starts," Nunez said. "He ran a great time in his last race – it was a :15.47 at 300 yards – and won by a length and now he just gave us an excellent effort. He's coming into his own." Trained by Jorge Farias, Kid Comeback finished with the third fastest qualifying time of :17.658 following his runner-up effort to Apollitical Flying. "He loves the distance," Farias said. "He ran a solid race. (Jockey) Oscar Andrade Jr. did a good job. Oscar is riding great and with each race he gains more experience. He gets better with each ride." Mario Tellez Montiel's Miss Montielita and EG High Desert Farms' Mayas Signature both earned their first career victories in the trials. Jonathan Roman piloted Miss Montielita for trainer Roman Figueroa to a ½ length victory in the opening trial, while Cruz Mendez rode Mayas Signature to a game head victory in the second trial. Nunez also saddled this filly by Fast Prize Cartel. "She's always gives you her all. I can see that she's starting to bulk up and maturing. She can be a little nervous," said Enrique Gonzalez of EG High Desert Farms. "We brought her a little goat to be her companion and that's helped her relax. I believe she's going to be a good filly that's going to always battle, maybe not in the biggest races, but she'll be competitive. We had three horses in this trial and to have one make the final is a great feeling." Miss Montielita is one to watch. The Special Cartel filly has started only twice and she's finished in the top two both times, including this victory in a quick time of :17.729. "She had some problems as a 2-year-old so they took his time with her," Figueroa said. "The owner gave her a layoff in order to bring her back at the end of the year. It didn't work out as smoothly. Time started running out and still didn't have a workout in her. It was decided to point her for this race and it worked out. She's gained some weight in the last few months and has shown that she can run a little bit. She comes from the family of horses raised by Tom "The Mongoose" McEwen. She's also in the Southern California Derby at the end of the year so we are looking forward to having some fun with her." Miss Montielita's dam is Miss Mongooseomatic, an unraced mare sired by Chickspecialmongoose, a half-brother to AQHA aged champion and multiple Grade 1 winner Mongoose Jet Eye. For the complete list of qualifiers to the Los Alamitos Maiden Stakes including times, sires, dams, owners, breeders, trainers and jockeys CLICK HERE.